Sports Illustrated is a venerable sport publication that has been in print since August 1954. As its title states, it is best known for the famous photography that adorns every issue. Sports Illustrated is also well known for its annual Swimsuit issue. Although there are and have been many competitors, the title still stands out as the premiere sports magazine. 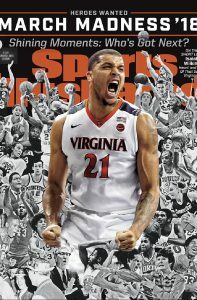 Its famous covers are always set in the zeitgeist of the leading sports story is in the world today, and have the ability to further establish the iconic images of athletes like Michael Jordan and Muhammad Ali. Reputations can be further enhanced with the publication’s Sportsperson of the Year issue. The chosen athlete for that year appears on the cover and a long article detailing their triumphs and humanity is dedicated to them. Regular features include: “”Who’s Hot, Who’s not, “Faces in the Crowd” which spotlights amateur athletes and their achievements, and “The Point After” which is found on the back page and written by various writers containing all number of sports related issues. The print version can found in the periodical section of the Bellevue University Library. Every issue printed can be found using the database Master FILE Complete.